Ferrari 812 Superfast Performance, Engine, Ride, Handling | What Car? Big front-engined V12 Ferraris have always been GTs – grand tourers – rather than out-and-out sports cars. However, Ferrari calls the 812 a “super GT”, meaning it should be able to get you to a racing track in the south of France in comfort but also embarrass pretty much everything else on the circuit once you get there. That sounds like a sports car to us. Well, it certainly has the performance. It was nice of Ferrari to prewarn us of this by, er, making it fairly obvious in the car’s name. But, if anything, the company has underplayed it; 789bhp in a road car with a V12 that revs to 8900rpm is, we’re quite sure, a crazier experience than you’ve ever had in a car. And the noise that comes from the 812’s exhausts is similarly otherworldly. It takes all of Ferrari’s wizardry and the car’s launch control mode to get off the line as quickly as possible. And this V12 has no turbochargers, making the savagery with which it pulls in any gear (it has seven) barely believable. And you’ll want to be paying attention should you decide to floor the accelerator in second or third gear on the move, because the engine’s response and the subsequent forward motion would have Tim Peake reaching for the grab handle. Put it this way: if the road isn’t bone dry, leave the traction control switched on if you plan on using the lower reaches of the accelerator pedal. Or, if you fancy a thrill with it off, be very prepared to start steering and catch the rear end. 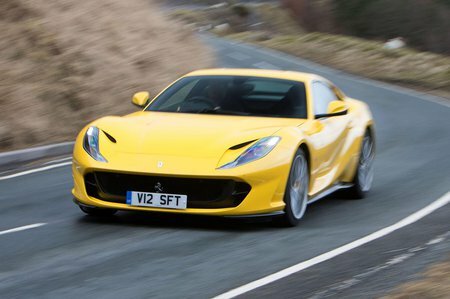 Handily, the 812’s dual-clutch seven-speed automatic gearbox is one of the finest we’ve come across. There’s some dither while the ’box hooks up from a standstill and at low speeds in town, but it is nothing short of brilliant on the move in both auto mode and when using the large metallic column-mounted paddles. And for a car that has a weighty V12 at the front and measures almost 4.7 metres long, the way the 812 changes direction is simply staggering. Ferrari’s steering set-up is typically light and very quick, and the same is true here. In fact, it’s quick to the point of making the car feel nervous when you first get behind the wheel; it does take some getting used to. 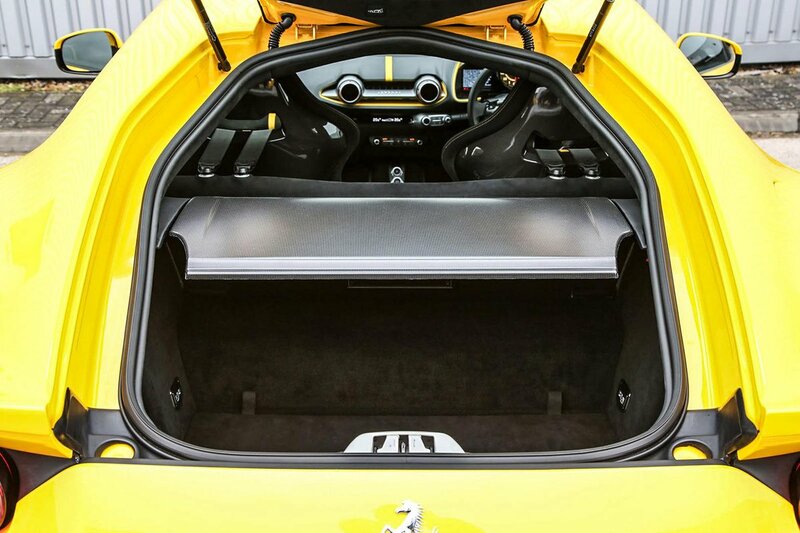 Especially so because rear-wheel steering is also standard, helping the 812 turn in to corners with even more gusto. Ferrari’s wheel-mounted Manettino driving mode switch can be flicked to Wet, Sport and Race, with further settings for switching just the traction control off or both traction and stability control together. If the road and weather conditions are bad, then Wet mode will keep the electronic aids fully engaged. But on a dry road, Sport and Race modes allow increasing amounts of slip at the rear – although surprisingly the 812 never feels overly snappy. The clever electronic differential also constantly monitors wheel slip and adjusts the amount of power to each rear wheel. Meanwhile, the standard carbon-ceramic brakes have great pedal feel and provide incredible stopping power on the road. 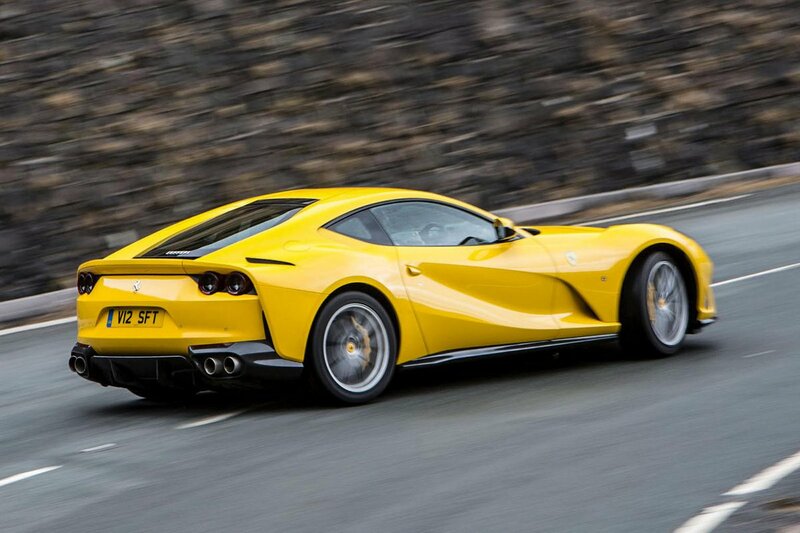 However, we’re not sure the 812 plays the GT role quite so well. It has a ‘bumpy road’ suspension mode that slackens the standard adaptive dampers for more comfort; while the ride is reasonable comfortable for a sports car, it's still firm and there’s some shimmy through the car’s body over rough surfaces. It’s also impossible to turn the exhaust drone down on the motorway and those huge 20in wheels kick up lots of noise inside. All told, the 812 isn't quite as comfortable as an Aston Martin Vanquish S, although it's far more engaging to drive. In fact, when it comes to driving thrills, it's closer to the mighty McLaren 720S – an astonishing feat for such a large, front-engined car.